MIC chief Datuk Seri S. Samy Vellu’s long-awaited decision to retire in January. MCA’s general assembly earlier this month show all the MCA’s leaders remain united. The much criticised ,RM5 billion Proposed 100 Storey Warisan Merdeka Mega Tower, to get activity up to provide jobs and incomes for people. Umno president Datuk Seri Najib Tun Razak has given the clearest indication yet that the 13th general election is imminent when he told the UMNO party faithful to get ready for it and to get into battle mode. Umno President Datuk Seri Najib Tun Razak wants the party to adopt the “People First” concept in all party programmes. He says it is to be line with the party’s transformation principles to place the interest of the people first in all its stuggles. He was speaking at the closing of the Umno General Assembly 2010 on Saturday. What does all those signal trying to tell you? The 13th general election is expected to be held very soon! So do expect to see an interest stock market movement. Probably, The FTSE Bursa Malaysia KL Composite Index To Hit Above 2,500 Points Very Soon! Please don’t miss the boat! This entry was posted on Wednesday, October 27th, 2010 at 1:57 pm	and is filed under stock market. You can follow any responses to this entry through the RSS 2.0 feed. Both comments and pings are currently closed. PETALING JAYA: The plan to improve the local stock market’s scale and liquidity will not see immediate results as the Government’s process of selling down its stakes in government-linked companies (GLCs) and attracting foreign investors to pick up local stocks will take time, according to fund managers and analysts. “Market liquidity can basically come in two forms – through retail investors, which tends to be more speculative in nature, and through institutional investors that invest in blue-chip stocks. The latter option is more suitable in creating a sustainable market,” Fortress Capital Asset Management Sdn Bhd chief executive officer Thomas Yong told StarBiz. MIDF Amanah Asset Management Bhd chief executive officer and chief investment officer Scott Lim said attracting foreigners into the local market went beyond having adequate supply or the right valuation. “Foreigners are not coming into the market not because there is no supply or our valuation. It’s other considerations like the economic structure, and how the proposed economic model will work,” he said. Yong said the listing of privately-held GLCs, such as Petroliam Nasional Bhd’s (Petronas) units Malaysia Marine and Heavy Engineering Holdings Bhd (MHB) and Petronas Chemicals Group Bhd (PCG), was the step in the right direction to boost market liquidity. While some might wonder why GLCs continued to hold large stakes in these newly-listed units as seen with Petronas holding a 69% stake in PCG and offering the rest for sale under the initial public offering (IPO) exercise, Yong said such decisions were based on overall investor sentiment. “For instance, the Petronas group will be able to gauge from the investor roadshows on how much to sell. They will not want a situation to arise where there is too much supply and a lack of demand,” he explained. The listing of these blue-chip companies also see pension funds such as the Employees Provident Fund (EPF) and Kumpulan Wang Persaraan (KWAP) taking up a substantial stake in these companies. PCG’s two cornerstone investors, EPF and KWAP, will take up 445 million shares, or 18%, of the 2.48 billion shares offered under its IPO. Despite pension funds holding substantial stakes, Lim said market liquidity would exist if investors were looking to buy and sell at the right price. Blue-chip companies were also offering a smaller retail portion under their IPOs, as seen with PCG and last year’s listing of Maxis Bhd, as these companies found it easier to sell shares in blocks to institutional investors, said a local bank-backed research head. Another research head said the retail offering for such blue-chip stocks could be smaller due to the higher retail price set during the IPO. Government-linked investment companies will also be selling down their stakes in listed companies to improve free float in the market. This can be seen with Khazanah Nasional Bhd paring down its stake in Tenaga Nasional Bhd, Malaysia Airports Holdings Bhd, PLUS Expressways Bhd and CIMB Group Holdings Bhd. However, some industry observers said the sell-down to date had been insufficient. Over the last nine years, the total market capitalisation of Bursa Malaysia had grown at a rate of 10% per annum, while stock markets in Indonesia and Singapore had grown at 24% and 17% respectively. Malaysia’s MSCI Asia excluding Japan weighting has shrunk to only 3.2% from 6% in 2000, causing international fund managers to disregard Bursa. To add to this, Bursa’s liquidity has lost its vibrancy, with its liquidity ranking in Asia has dropped from third in 1996 to 14th this year. There is also limited diversity in the market, be it in terms of products or currency. 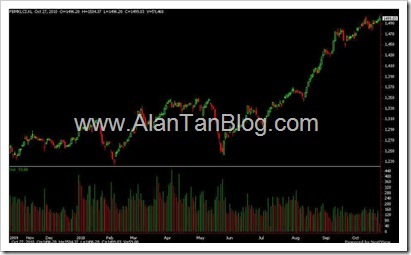 Is there a super bull run in 2010? THE recent rally in our local bourse has prompted many seasoned investors, especially those who experienced the super bull run in 1993, to wonder whether the current rally is about to turn into a real bull run. Of course, nobody can tell for sure what will happen next, but we certainly can do some homework, comparing the circumstances back in 1993 against the current situation. In 1991, Tun Dr Mahathir Mohamad unveiled the philosophy of “Malaysia Incorporated” which was a development strategy for Malaysia to achieve a developed nation by 2020. In the early 1990s, despite slowdown in the global economy, as the third largest economy in South-East Asia, after Indonesia and Thailand, Malaysia was supported by relatively strong macroeconomic fundamentals and resilient financial system. With the real GDP growing at 9.9%, ringgit appreciation, strong export growth and the Government’s measures to hold inflation low at 3.6%, the local stock market became an attractive alternative to foreign investors. Before 1993, foreign investment in Malaysia was mainly dominated by long-term direct investment in the manufacturing sector. However, as a result of measures taken to develop our domestic equity market, coupled with the strong economic backdrop, we saw a massive influx of foreign capital inflow, which helped fuel the super bull-run in 1993. Within the year, the market increased by 98% to reach an all-time high of 1,275.3 points and foreign investors’ participation accounted for 15% of total trading value of our local bourse. This had also driven the market into a highly speculative one, which lured many retailers into the market, thinking of making fast and easy money. With the presence of new and unfamiliar players, the market became a huge “casino”. Retail investors bought into stocks based on rumours rather than company fundamentals. Among the hottest topics during that time were the awards of government mega projects, privatisation candidates, sector play and regular news on upward revision of corporate earnings. Examples for the highly speculative stocks were Ekran, Ayer Molek Rubber Co, Berjuntai Tin Dredging and Kramat Tin Dredging. In 1993, with the economy booming, the Government planned several mega projects, including the KL International Airport (RM8bil), Johor-Singapore Second Link (RM1.6bil) and Kuala Lumpur Light Rail Transit (RM1.1bil). The news of contract awarding immediately sent the market into speculative mood on those potential candidates. Similarly, the news of the Government planning on privatising some of the its own corporations, such as Petronas, KTM and Pos Malaysia had also driven these counters into prime trading targets. Besides, the ease of accessing bank credit by investors also contributed to the market rally. We noticed that a high percentage of loans was channelled to broad property sector as well as the purchase of securities. Recently, our Prime Minister Datuk Seri Najib Tun Razak unveiled the Economic Transformation Programme (ETP) with the aim to boost our gross national income (GNI) to US$523bil in 2020 from US$188bil in 2009. The programme is to attract investment not only from the Government, but also (more importantly) from domestic direct investment as well as foreign direct investment. In view of strong economic growth, our GDP growth is anticipated to increase by 6% this year. In September, we notice that there was a net inflow of foreign funds again in our equity market. Over the past few weeks, the average stock market daily volume had been hovering above one billion shares per day. Almost every day, the top 10 highly traded stocks were those speculative stocks with poor fundamentals. In addition, we noticed that some retail investors had started to get excited again in the stock market. According to Andrew Sheng in his book titled From Asian To Global Financial Crisis, there were two main indicators to irrational exuberance during the super bull run in 1993. The first was the amah (domestic maid) syndrome. We need to be careful when amahs got excited about the stock market. This was because they did not know what they were buying and would always be the last to sell. The second indicator was when businessmen began to speculate stocks in the stock market. This was because they might neglect their businesses and use some of their cash for speculation. Comparing our current market situation with the 1993 bull run, there are certain similarities that we see, such as strong economic growth, ringgit appreciation, inflow of foreign capital and ease of credit. However, our local retailer participation is yet to get boiling, which may be the last push factor towards the bull run. Hence, once the participation of the local investors starts to get heated up, together with more inflow of foreign fund, that may be the signs of the market heading for a ‘mini’ super bull run. KUALA LUMPUR: Stocks on Bursa Malaysia felt the liquidity rush from the fresh round of quantitative easing by the United States as the continued inflow of money arising from the attractiveness of the ringgit and the economies of emerging markets sent the benchmark index to a record high. FTSE Bursa Malaysia KL Composite Index (FBM KLCI) closed up 0.5%, or 8.1 points, to 1,519.84, eclipsing the previous record close of 1,516.22 set on Jan 11, 2008 on keen buying of plantation and consumer-related counters. “There is more upside. One of the key drivers is the shift of funds from developed to emerging markets,’’ said CIMB Investment Bank Bhd research head Terence Wong. The push towards the all-time high has been in a large part driven by inflows of institutional funds into large-cap stocks. The flooding of US dollars from the ongoing quantitative easing into global markets has weakened the dollar against a number of currencies in Asia, hence accelerating the flight of liquidity to countries such as emerging economies that offer higher returns. Emerging markets have seen strong economic growth rates and have not been bogged down by structural problems, such as high unemployment rates, plaguing the developed world. “We are only part of the picture as there has been also strong interest in Thailand, Indonesia and the Philippines,’’ said Maybank Investment Bank Bhd head of research Andrew Lee. Analysts explain that Malaysia is grouped in a category of markets that have a low correlation to the US stock market and with the growing strength of Asia as a source of growth, the country might be even less so dependent on the health of the US economy. They said although foreign participation in the local stock exchange had been slowing in recent months compared with the past, interest in picking up blue chips had driven the FBM KLCI to lofty valuation levels, with the index yesterday closed at 18.29 price-to-earnings ratio. “Fundamentally, earnings have so far been within expectations,’’ said Kenanga Investment Bank Bhd research head Yeonzon Yeow, adding that while earnings in general had not hammered estimates, the liquidity-driven rally was pushing the market’s price-to-earnings ratio to the upper strata in historical terms. High valuations, however, might not be a deterrent at the moment, as stocks were propelled by the huge amounts of liquidity that was swirling in the market rather than the fundamentals of companies, analysts said. They said a number of mid-cap stocks had kept stride with the rise of their larger brethren and that investors and punters would look at such stocks once larger stocks became too pricey. One key development analysts are watching out for is the listing of the country’s largest initial public offering (IPO) – Petronas Chemicals Group Bhd – and its eventual effect on liquidity in the market. Analysts worry that the IPO, which has been well subscribed by institutional investors, might draw liquidity from the other big-cap stocks once it is traded on Bursa Malaysia. M’sian market at record high – so what is the next thing? WHAT next? That might be a common question asked after the FTSE Bursa Malaysia KL Composite Index hit a new record high this week and therefore heads into uncharted territory. That question is difficult to answer because unlike the previous rallies in 1993 and in 2008, the run-up this time around has been surprisingly orderly. Volume, often an indicator of fervent euphoria, has remained sane and while the index has set a record, trading activity on Bursa Malaysia is nowhere close to previous high levels. This would suggest there is still more room to go. Although the rise this time has less to do with direct retail interest as it did in the past, the professionalism in investing these days – where more Malaysians are putting their hard-earned money in the hands of professional managers to invest – is also a good sign. It’s often joked that when retail interest shoots up and everybody becomes a tipster, it’s time to sell. Also a signal would be syndicate activity returning to the market in a big way. That, to my knowledge, is nowhere close to the situation in previous rallies and surely is a contrarian indicator worth following. Another fundamental backing to the rise this time would be borne by the efforts ongoing to revitalise the economy, especially the private sector and the investments it is expected to pour into the country. Some may argue that economic growth might have some correlation to corporate earnings but the balance sheet and cash generation capability of most companies are far better now then in the past. Maybe it’s also the better health and performance of the largest companies in the country where more focus and strict adherence to key performance indicators now then before have led to better financial performance and hence their attraction. Furthermore, as more companies in Malaysia venture abroad and with the large commodity companies riding on skyrocketing crude palm oil (CPO) prices, the story at home might not swing investor focus as much as it did in the past. But the surge in the local stock market also has to do with the amount of money that is swimming around globally, hunting for the best returns they can get. Between the United States printing money from its quantitative easing and the still super-low interest rates globally, cash around the world has been hunting for returns. They have so far got it from commodities. Among this group, CPO is rising and rubber has hit an all-time high. And in emerging Asia, they might have also found an answer for now by buying the currencies of Asian economies. The flood of money into Asian currencies has led to reciprocal rises in the stock markets in the Philippines and Jakarta, which have in recent months peaked at their all-time highs, suggesting that money is trying to capitalise on growth in equities as well as currencies. Markets in Thailand and Singapore are also rising strongly. To pour more cold water on the rally, the market is said to be trading at high price to earnings ratio and economically, the horizon globally is less rosy. Malaysia’s economic growth is forecast to fall next year to between 5% and 6% from a projected 7% this year. Is 2010 a replica of the 1993 bull run? I don’t think so although most would love the ride, not the end. The situation this time is vastly different but any time a market hits an all-time high, some caution should come into play. A market high does not happen often. IT has been eight months since the New Economic Model (NEM) was launched. While Malaysia’s economy has rebounded during this period, the recovery is primarily a function of the improved external environment. Our structural weaknesses have yet to dissipate. If anything, this recovery should serve as a reminder that given the ever volatile and fluid global economy, it is imperative for Malaysia to swiftly remedy the structural weaknesses. Malaysia should strive to steer its economy in the direction which makes growth more sustainable and resilient, instead of leaving things to fate and chance. The Government recognises the urgency for economic transformation. This was why the NEM was conceptualised in the first place. As part of the Economic Transformation Programme (ETP), the NEM will address the structural weaknesses through a series of bold fundamental measures. Only when these weaknesses are overcome can a solid foundation be created for the National Key Economic Areas (NKEAs) to fully deliver their results. In the past several months, the NEM ‘mode of thinking’ has been integrated into Malaysia’s policy agenda. This is reflected in the 10th Malaysia Plan (10MP), which fully endorses the goals of the NEM: high income, sustainability and inclusiveness. The NEM not only spells out the kind of nation we want to be; it also prescribes key reforms that are needed for achieving these goals. This makes it especially meaningful that the eight strategic reform initiatives (SRIs) (see table) – which in essence are policy clusters identified in the NEM to achieve the goals – have clearly been adopted as the economic growth framework in the 10MP. For example, in “creating a private sector-led economy”, the 10MP recognises the need for removing market distortions through rationalising subsidies; modernising business regulation; and introducing competition legislation – all of which are among the proposed policy measures derived from the original SRI that calls for re-energising the private sector to drive growth. It is true that many of the policy measures derived from the SRIs were already being planned or initiated by the government. In reiterating the importance of these policy measures, the NEM seeks to augment and supplement ongoing policy works and, in some instances, even clear the path for the implementing agencies to pursue these initiatives with increased vigour. This process of implementation is gaining traction. In recent months, we have seen the government announce many policy packages needed to make the NEM a reality. In Budget 2011, the Government has pledged to reform the insolvency laws, including relief provisions for companies and individuals with financial problems. This is in line with the NEM’s stance that insolvency laws should not stifle risk taking and create an undue stigma of failure. In addition, as part of the training programmes, the government has committed to spending RM474 million to enhance the technical skills of non-graduates, especially school leavers and youths. This is in line with the NEM’s suggestion for more focus on technical education and vocational training. Such training is crucial because there is high demand for skilled workforce in technical fields; continuous improvement will also benefit in particular workers who may be displaced from low value added jobs in the course of economic transformation. Most of the policy announcements made thus far may not qualify for juicy, gripping headlines. But if implemented well, the policy measures could go a long way in benefitting the people in ways that they themselves are not aware of. For instance, through a series of improvements in streamlining bureaucratic procedures and enhancing the business climate, Malaysia has moved up to 21st position (from 23rd) in the World Bank’s Doing Business Report for 2011, released last week. Such a development did not cause public euphoria but it signals the growing confidence among investors and businesses out there, both foreign and local, which could attract more investments to the country and create more well-paying jobs. What is particularly heartening is that since the articulation of the NEM, many government agencies have risen to the challenge, working closely with the private sector and other stakeholders in designing and implementing the enabling policies that fall under their respective jurisdiction. In so doing, the agencies have added to or modified the policy measures recommended by the National Economic Advisory Council (NEAC). This is necessary since the agencies are most familiar with the resources, requirements and restraints pertaining to the implementation of a particular policy. Furthermore, the list of recommendations by the NEAC was not intended to be exhaustive. The recommendations are selected critical policy actions that we must undertake; they do not in any way represent all there is to be done. In the larger scheme of things, the improvisations made by these agencies also point to the fact that they have begun to assume the ownership, and an active leadership role, in the implementation process. The NEAC views this favourably as long as the additions or modifications to the proposed measures adhere to the policy objectives and guiding principles of the NEM. To facilitate their work, the NEAC is completing further details on a number of key policy measures within the various SRIs. In due time, the details will be made available to both the agencies and the public. We have embarked on a journey of change. It is a lot of hard work – reform is never easy. But Malaysians deserve nothing less than an advanced nation promised to them. The government must now step up its reform efforts and more importantly, stay the course in this journey. Is it time to trade or invest when the market is at an all-time high? Is this the time to enter the equity markets or is this the time to get out? This is the question that is always asked when equity markets are on a roll or when markets are rallying. For the cautious types, this is the time to sell or to wait but risk-takers and optimists feel that markets can still go higher despite the fact that much of the performance of stock markets in emerging Asia, analysts point out, is largely due to the liquidity sloshing around in the system chasing higher returns that may not necessarily be based on fundamentals. Cooler heads will point to the current disconnect between the macroeconomic outlook and the equity markets. Long-term and cautious investors question how long will the “party” brought on by the funds entering emerging market equities will last. Already World Bank managing director Sri Mulyani Indrawati has warned that quantitative easing may potentially create bubbles in assets such as equities, currencies and property. She says Asian governments may need to turn to capital controls although these curbs should be targeted, temporary and tailored to address specific problems. Morgan Stanley Research analyst Gerard Minack says in a Nov 5 report that markets are disconnecting from the macroeconomic fundamentals and the US Federal Reserve’s RM600bil quantitative easing programme may not be enough to significantly reduce recession risk, which is concentrated in the next couple of quarters. “The other issue, however, is how long the markets can run on the quantitative easing without confirmation from macro data that things are improving,” he asks. Minack says quantitative easing has pushed developed-world equities through the ranges seen over the past year and will not be able to defy the macro outlook for long. “Before I turn cautious, however, I want to see that risk assets are starting to respond in a more normal fashion to incoming macro news,” he says, adding that the reaction to news have been reverse to what usually happens. “It’ll be important when markets return to a good-news-is-good/bad-is-bad behavior,” Minack notes. He says although the rest of the world outside the developed economies look fine with purchasing manager sentiment looking solid and with little risk of another global recession, there are hints of slowdown in Asia. “For countries that produce monthly purchasing manager indices (PMIs), the four weakest – all below 50 – are in Asia: South Korea, Japan, Taiwan and Australia,” Minack says, although China, India and Indonesia remain strong. A reading below 50 for the PMI gauge denotes a contraction. Although the pace of growth has slowed in the Asian emerging markets and will continue to slow at least into the first-half of 2011, stock markets have continued to surge. The FBM KLCI, for example, has risen nearly 20% from a year ago and is now at historical highs. If the market always anticipates the economy, than this time around investors may have gotten it wrong as growth next year, at least by Government estimates, will be lower at 6% compared to the expected 7% for 2010. However, stock-market movements cannot rely on the amount of liquidity alone going forward, says Malaysian Rating Corp Bhd chief economist Nor Zahidi Alias in an email reply to StarBizweek. “Fundamental factors will have to support the overall trend. Should there be a moderation in global economic growth following the persistent weaknesses in major economies, regional markets (including Malaysia) will experience some degree of correction,” he points out. Nor Zahidi says Asian economies, despite seeing more intra-regional trade these days, still have to rely on the G3 (United States, European Union and Japan) economies as the final destinations of their products. He says right now, the rising stock market hints at the trend of economic growth in the next three to six months and is reflective of investors’ confidence in efforts by the Government over the past year to enhance efficiency thruogh the Government Transformation Programme and the Economic Transformation Programme. “These have, to some extent, given positive vibes to foreign investors who, in turn, have increased their exposure to the Malaysian market,” Nor Zahidi says. He adds that 0ther positive attributes of the Malaysian economy include the relatively stable growth prospects in the next few years following an expected steady improvement in private investment as well as resilient private consumption. Nor Zahidi says among the signs of improving investor sentiment was the 9.4% surge in total investment in the first-half of the year compared to same period last year. “The bond market is accordingly benefiting from investors who prefer debt instruments in Asian economies rather than those of the developed countries. This is reflected in the foreign holdings of Malaysian Government Securities which surged to 26.8% in September,” he adds. Meanwhile, the World Bank which recently released this year’s Malaysia Economic Monitor, expects the country to achieve growth of 4.8% next year compared to 7.4% this year. In the developed economies, despite risks of another downturn and sovereign debt concerns, markets have also risen with the S&P 500 and the Stoxx Europe 600 Index at its highest since September 2008. For those who say that markets, at least in this part of the world, have some way to go before tanking, the arguments are that fundamentals such as positive demographics, youthful populations, urbanisation and rising middle classes will continue to drive domestic demand. This is the view of HwangDBS Investment Management Bhd chief investment officer David Ng, who says conditions are ripe for the local bourse to experience a bullrun similar to what happened in the nineties. Furthermore, these optimists argue that opportunities abound in the emerging markets of Asia, where governments have embarked on large infrastructure projects to boost their economies and ensure long-term growth. They counter that as the outlook is still gloomy and with low household consumption in the developed economies, where else better to place their money than in the emerging economies? Their views are backed by the weak US dollar, brought about by low interest rates and now facing more headwinds from the Fed’s programme to purchase US Treasury bills over an 8-month period. The jobs outlook seems to be in favour of these group of investors too as unemployment in the United States stands at 9.6% while in the 16-member European Union, it now stands at 10.1%. The data further supports these optimists, who point to the fact that deep public-sector spending cuts in the European Union over the next few years may crimp demand. General election tops agenda in series of high-level Barisan meetings. KUALA LUMPUR: Barisan Nasional is holding a series of high-level meetings, purportedly to prepare for the coming polls. The Barisan management committee will meet tomorrow, followed by the ruling coalition’s supreme council meeting on Saturday. This will be followed by the much-anticipated Barisan convention on Nov 28. According to officials, top of the agenda would be preparations for the 13th general election, expected to be either next year or in 2012. Prime Minister Datuk Seri Najib Tun Razak, who is also Barisan chairman, would brief component party leaders on what is expected of them as well as seek feedback on what needs to be done. The meetings come in the wake of Barisan’s double victory in the Batu Sapi parliamentary and Galas state by-elections. PETALING JAYA: Barisan Nasional will hold its supreme council meeting on Saturday to discuss preparations for the 13th general election. The meeting will be chaired by Barisan chairman Datuk Seri Najib Tun Razak. His deputy Tan Sri Muhyiddin Yassin will hold a management meeting with component party leaders at 5pm tomorrow. These two meetings will be followed by the Barisan convention on Nov 28. The buzz of an impending general election is getting louder despite speculations on the date. Some said it would be held some time next year while others said it would be in 2012. Either way, Barisan has a lot of ground to make up before the elections as it is bent on regaining the rakyat’s support it lost in the March 2008 general election. The problems plaguing PKR have benefited the Barisan with some quarters urging the coalition to capitalise on the opposition’s predicament. The Barisan’s victories in the recent Galas and Batu Sapi by-elections have boosted its morale but its top leaders are aware it is not a yardstick at national level. Saturday’s meeting is also in line with Umno president Najib’s call during last month’s party general assembly to members to gear for the elections. His call was echoed when Muhyiddin said the elections were “just a few months away”. “The meeting will not discuss a particular date but it is not wrong to say it could be in 2012,” said a party source. Component party members are expected to be briefed on Najib and Muhyiddin’s nationwide visits from early next year to meet the people and party grassroots. However, Barisan secretary-general Tengku Adnan Tengku Mansor downplayed Saturday’s meeting, saying it would be a normal meeting to discuss the Barisan convention and a post-mortem on the Galas and Batu Sapi by-elections. He also said they would not be discussing the trouble-ridden PKR or Datuk Zaid Ibrahim’s decision to quit the party. The Barisan convention is expected to discuss new rules for the coalition. Proposed amendments include the possibility of direct membership and the admission of new members through a simple vote majority. For the first time, the convention will be held at Wisma MCA instead of the Putra World Trade Centre. Najib will be delivering the keynote address at the convention, which will include closed-door sessions for component party members. KUALA LUMPUR: Forget about reading tea leaves or peering into crystal balls. Feng shui master Prof David Koh predicts that the general election will take place before May. The principal consultant at the Malaysian Institute of Geomancy Sciences said the economic forecast next year indicated that the general election was around the corner. “We forecast that there will be a spike in the country’s economic performance between March and April. “And this will usually take place before an election,” he told reporters at the 2011 Outlook Talk – Year Of The Rabbit at the Kuala Lumpur Convention Centre yesterday. He has a message for the men, too. “Strong, young women will come to the fore in politics, finance or economy, in the February to March period,” he said. “Scholars will also gain prominence between April and May. They will either bring fame to Malaysia or contribute to its development,” said Koh. He also said according to the I-Ching calculations, it was predicted that political leaders were likely to encounter internal problems in their parties. “Some (problems) are not noticeable now but they are boiling over. “There will be a lot of pretentious members who will trick their leaders into believing they are good but have their own private agenda,” he said, adding that the internal problems could reach a critical point in August and September. Contrary to public belief, he said Malaysia would not experience a collapse in the property market next year. Koh took centrestage when he presented the country’s outlook including the possibility of Dooms­day 2012. Such a doomsday, he said, would not happen. On natural disasters, he said heavy rains in the period of February to March might lead to floods in the northern region.